Hopping from branch to branch on the rocking trees. Of the burnished rainbow throat and the silver breast of a dove. And flashing adown the river, a flame of blue! The kingfisher flies like an arrow, and wounds the air. 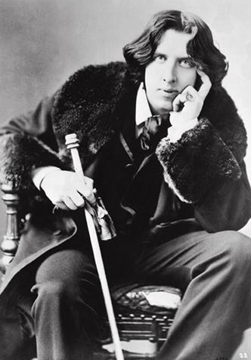 Oscar Fingal O'Flahertie Wills Wilde, better known as Oscar Wilde (1854 - 1900), was an Irish poet and author and is considered one of the greatest playwrights of the Victorian era. The son of unconventional parents, both of whom were writers themselves, Oscar was an outstanding student who demonstrated literary talent from an early age. An avid and vocal devotee of aestheticism--the belief in art for art's sake--Oscar traveled extensively lecturing on its merits, and was an instant celebrity when he arrived in America. Outspoken and flamboyant in his lifestyle and dress, Oscar was similar to Walt Whitman in that he had as many detractors as he did fans. His charm and wit were undeniable, though, and many of his wry remarks and clever comebacks are preserved in quotation books today. Oscar's life and work inspired numerous films and biographies, but he died penniless in Paris at the age of 47. I love the kingfisher wounding the air. I am an Oscar Wilde fan. I have always enjoyed Poems of Oscar Wilde. Thank you for this one which I do not recall ever reading. Forty-seven was way too young for such a talented young man to die.